This is long overdue, BUT the above vintage "Deco" bracelet was an amazing find by my 'rents in a Lewisburg, West Virginia antique store. Who knew West Virginia had so much to offer? First a Democratic senator and now this! 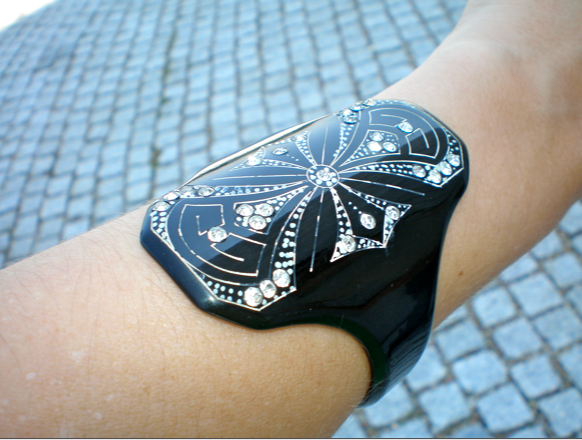 My mother thinks it's a 1920's or 1930's cellulose cuff and I think it's awesome no matter what it is. Have you noticed all the jewelry designers copying such things in the last couple years? Anyhow, you may notice the cobblestones below my arm. That's a clue that the picture was taken in Williamsburg, VA, where we traveled after North Carolina. Don't you just love a cobblestone? P.S. If you happen to find yourself in the area, you might also check out Candies by Mary, where they sell the most delicious homemade hard candies.